Need inspiration for your own renovation project? Or simply fancy having a look around a gorgeous period property? This home, half cosy Georgian cottage, half lofty Victorian villa, is one of our favourites. Read on to find out how its owners went about creating a wholly perfect family house, giving it a fresh new look that's right on trend, then browse the rest of our real home transformations. Read our guide on renovating a house, too, for more guidance. Owners Julia Currie, a photographer (juliacurriephotography.com), and her husband Kevin, a marketing director, live here with their children, Florence, 16, Theo, 14, and Henry, 11. Property A four-bedroom part-Georgian, part-Victorian house in Gomshall, Surrey. What they did They’ve decorated the interior to suit their taste and lifestyle, and have plans to create a large, open-plan kitchen-diner in the future. 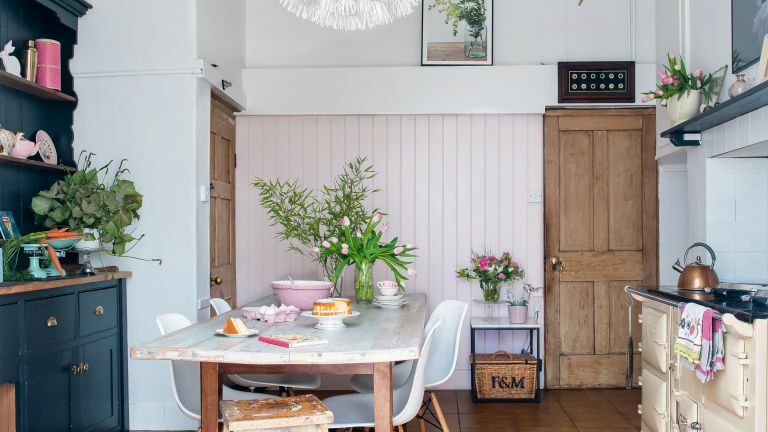 Julia Currie always wanted to live in an old property, and when she found this country home on the edge of the Surrey Hills she could hardly believe her luck. Finding the part-Georgian, part-Victorian house was like getting two homes for the price of one. The property was originally one of two terraced Georgian cottages. Two-storey Victorian extensions were later added to each cottage, during which time the cottages were knocked through to create one large house. In the 1950s, it became a guest house, before becoming a single property once more. ‘Thirty years ago, it was sold again and converted back into two homes, each with a Georgian and Victorian part. And that’s what we inherited,’ says Julia. ‘There’s a real difference between the architecture and atmosphere as you move through the house. The house is a work in progress – Julia calls it her ‘25-year project’ and has plans to knock through the kitchen, dining room and utility room to create a large cooking and living space that will become the hub of the family home. In the meantime, the photographer and stylist is making subtle décor choices that honour the history of the house while expressing the family’s passions and personality. ‘I painted the dresser black, much to my mother’s horror. But it’s much more me now,’ laughs Julia. She also installed tongue-and-groove panelling where the previous owners had cork tiles on the wall, choosing a calamine pink paint. ‘I’ve tended to use soft tones throughout the house, such as the pale grey in the living room and cream in the bedroom. 'The exception is my office, which is in the original entrance hall-dining room. I chose a dark blue here to make it feel cosy but I kept the ceiling white as I didn’t want it to become too cave-like,’ Julia says. The story of the house is revealed as you walk through its rooms. The different shutters and window designs in the Georgian and Victorian parts show shifting trends in architecture; the newly exposed floorboards reveal patches of paint, indicating where rugs would once have been laid; the varying ceiling heights show the house’s transition, from country cottage to grand Victorian home.